During the February 18th workday no work was done on fuel tank leak - Steve may have an opportunity during the week to slosh it. Ian removed the magneto from the Triplane so Cameron could evaluate it and see what can be done to improve the spark. Cameron said the mag's asymmetric lobes are not unusual (some quirk of electricity sometimes requires the asymmetric design?) and after inspecting the lobes Cameron said there was little evidence of wear. Cameron took the mag home to see whether a little TLC would make the spark more robust. Ian is plotting improvements to the way the mag bolts into the Triplane - it would be a 10 minute job except for one bolt hidden away in the dark, out of sight. That one bolt can take an hour to remove because the job is done exclusively by Braille and the very tight access due to surrounding components. Ian estimates you can only manage 30 degrees of rotation on the bolt per shot! First order of business on the 25th was to address the fuel tank leak! Mike Craig sloshed the fuel tank leak but a pressure test with the seams held under water revealed that the area was still leaking. Additional leaks in the tank's side panel seam were also discovered! A large tub was filled with cold water for the dunk test and since bungs for the oil and fuel tank and fuel gauge were non existent Ian held his hands over the fuel tank sump opening under water. Tom Gaylord helped seal the fuel gauge opening and Mike operated the air hose down the filler neck. Mike elected to take the tank home with him to Denton to properly repair the leaking seam / rivets. 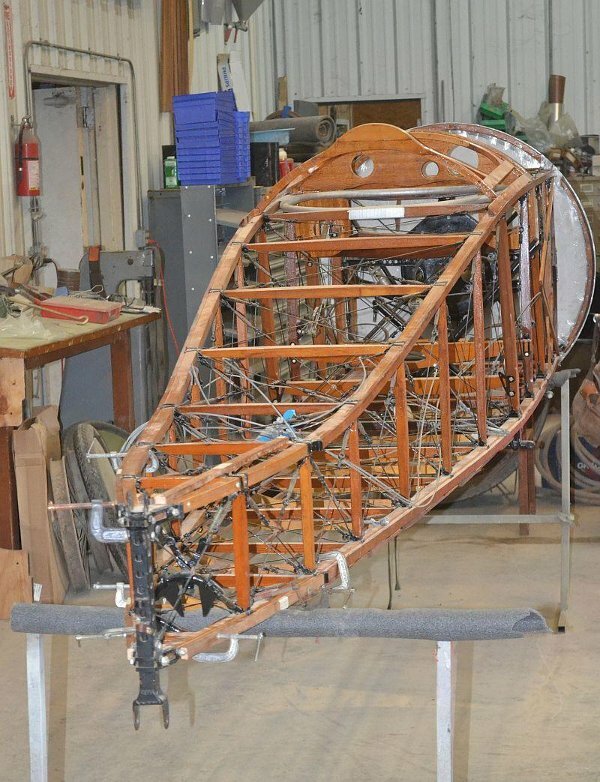 Cameron Whitaker brought the Triplane's magneto back after he rebuilt it at home. He rewound the condenser, using some 3,000 ft of 45 gauge wire in a wet lay-up. The unit was sealed as a final step. Cameron also replaced the wire feeding spark to the engine. Quite a few of the guys spun the drive gear just to watch the fat spark jump the gap! No one managed to jolt themselves while playing with it. By the 25th Mike Craig reported that he had the fuel tank's side panel off. Mike reports it only took about 35 minutes to remove the side panel! To his surprise the inner surfaces of the tank still had the plastic protective film on it. The film's adhesive has been turning blue and the plastic film has been damaged by the fuel which is the basic cause of the leak. The plastic film has been pulling away from the metal and was in danger of clogging the fuel sump. Mike has decided to also remove the side panel from the other side - the castor oil tank side - to remove the plastic film if it was left inside that side of the tank too. On the 18th Steve started a few of the volunteers sorting through drawings of the aircraft (from various sources) to provide some guidance to Tom and Dave Miller. Tom and Jerry Stark were going to be looking into (literally) the fuel tanks to evaluate their condition, and Dave Miller and Jerome Matula were going to be working on the longeron stringers (or rub strips) on T-1. The fuel tank design is weirder than I'd ever imagined. I've marveled at the fact that the fuel tank has a recessed box in it for the machine gun's ammunition and two large oval holes running clear through the tank for the aileron actuation rods to pass through, but it turns out that the tank is braced from within by rods passing through the tank - fore and aft, top to bottom and side to side. The rods pierce the fuel tank's skin and are cinched up with nuts and covered with a cap which is soldered into place to prevent leaks. Ap- parently an extra measure to prevent the fuel tank seams from taking a beating from sloshing fuel? Tom and Jerry found that the insides of the tank are in pretty good shape for 90 year old fuel tanks, with just a little rust evident inside. However, not all the nooks and crannies can be seen because there are baffle plates inside as well. The fuel gauge on T-1 was removed and it was found that the gauge is not Thomas-Morse original but was adapted from some other machine. 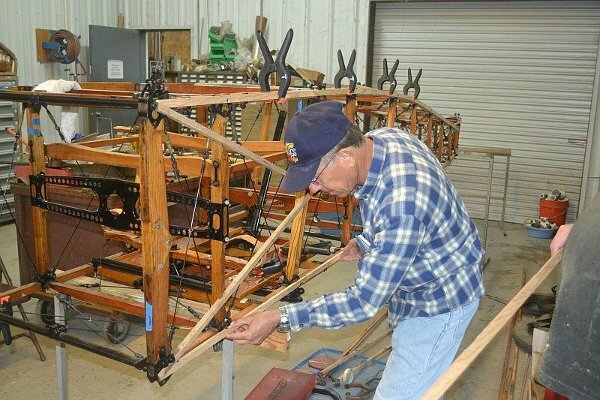 Dave and Jerome spent much of the day working on the wood strips that keep the fabric covering from fraying against the bolt heads and brackets that stick out from the fuselage's longerons. After looking at the plans, test fitting up the sections of wood crafted to date and reviewing everything with Steve they went to work on the table saw thinning the strips down and preparing the sections for gluing into continuous strips. The final dimensions were those called out in the Replicraft plans - the strips were originally made to dimensions measured off the strips that were removed. It is hoped that by thinning the strips they will conform to the curvature of the longerons without needing to be steamed. At the end of the day the four strips were all glued up and ready for test fitting, final adjustments, and attachment next work day. Steve Richardson came in and was working on reinstalling the two engine bearer mounting plates in T-1. The engine mounts were bolted in but the job will need to be finished next work day. On the 25th Dave Edgerly cleaned up one of the Tommy carbs for the 80-hp Le Rhone rotary engine. Dave noted that this intake had a debris screen to prevent FOD. The carb also had a curved actuation lever. The clean-up was straightforward except it wasn't as smooth as he expected when he was done, so he rustled up some 0000 steel wool and polished the carb bodies and the slide and was very happy with how smoothly the carb worked afterwards. Steve Richardson finished the installation of the T-1 engine mounts, cinching everything up and installing the cotter pins. Steve also realized the rudder pedals were installed backwards so he started turning them around. He also began reinstalling some of the cockpit instrument panels - taking time to repair one of the sub-panels. 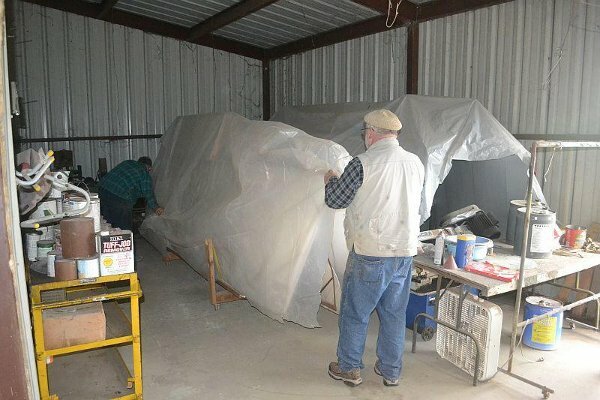 Ron Marcotte and Dave Miller continued working on the fabric rub strips that are installed along the fuselage longerons. Ron worked on fitting up the sections on the very tail end of T-2, plus the vertical strips on the tail post. Dave continued working on the strips for T-1 with assistance from Ron. The upper longerons of the Thomas-Morse Scout have a very sinuous curve which makes fitting the strips difficult. The whole task is complicated by the precise reliefs cut into the backside of the strips for the brackets and the holes partially drilled for bolt heads. Mike Craig tore apart an 80-hp Le Rhone castor oil pump for the Tommy, and cleaned the unit up. A new gasket was made for the pump cover, and then the unit was treated to minimize corrosion during storage, receiving a coating of Marvel Mystery Oil and being wrapped up in a plastic bag! On the 18th Dave Edgerly and Dave Orloff worked on the Cub's annual inspection and finished nearly everything except for a compression test which Steve hopes to tackle during the week between workdays. On the 25th Steve and Roger conferred on the Cub's engine and elected to change it out for another Continental A65 in storage. A search of the LLC hangar turned up several engines, but the selected unit was blocked in by other engines and pallets! Dave Edgerly operated the forklift and finally the engine was pulled from storage and placed in Steve's truck for the trip to Memphis. 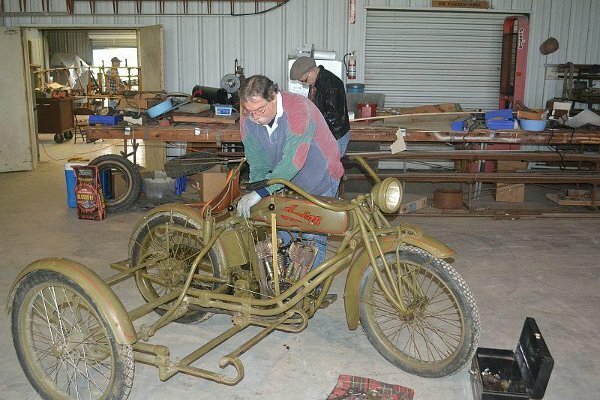 Steve will go through the engine and make sure it is OK.
John and Johnny Bush started working on getting one of the USMC Kawasaki's running to use as a field bike - I guess they are getting tired of constantly walking back and forth between the hangar and the shop! Cameron and Bruce Robertson worked on various Model Ts stored under the shop overhang. Nothing was run during the day as the field was a muddy swamp from all the rains and run-off! On the 18th Kevin Monahan worked on the Indian's fuel system. 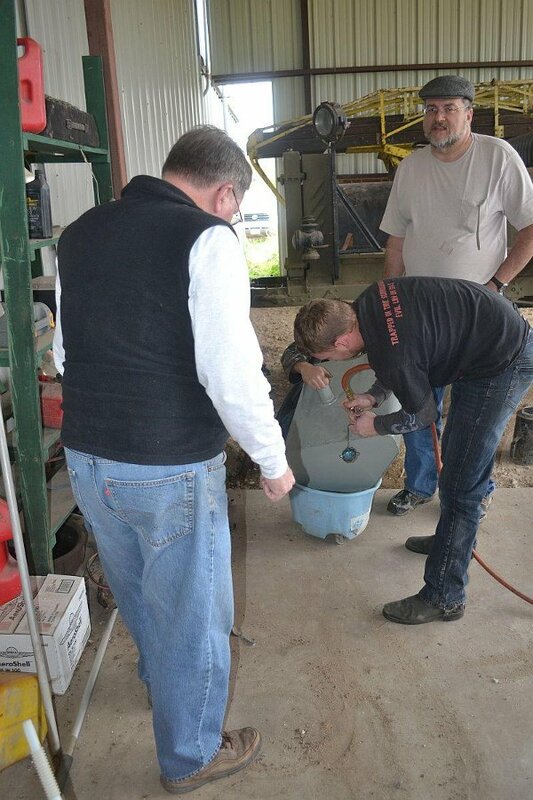 John Bush flushed the tank and Kevin installed a fuel filter. Kevin worked inside the motor's right side engine timing chest - resetting the alignment marks on the gears. In removing the magneto for Cameron Kevin noted the marks were all misaligned. End of the day saw Kevin cutting a new gasket for the timing chest cover and just at the very end of the process realized he'd need to create a Mk.II version and bin the first attempt. Cameron brought back the rebuilt Harley Davidson magneto and coil and returned it to Kevin. Kevin and Dave Miller spent some time manufacturing a key to fit the magneto drive gear onto the magneto's drive shaft. On the 25th Kevin resumed working on the Indian. Having reset all the timing marks in the timing chest Kevin fatalistically figured it would either run much better or fail to run at all. With the beast back together again and ready to run the Indian was fueled up and astoundingly enough, started on the first kick! Kevin rode it around for a bit and everyone gathered to watch it idle. There are exhaust leaks and compression leaks still needing to be addressed, but it was a great stride forwards to have the bike running again! Kevin says the bike keeps oil fouling the rear cylinder's spark plug and part of the cause seems to be too much oil in the crankcase. 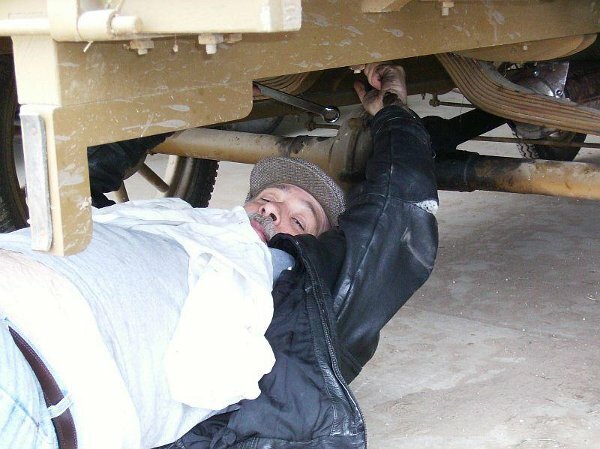 Kevin will need to address that before adjusting the oil pump. Dave Miller and Kevin looked at the kick starter mechanism. The gears don't smoothly mesh the entire stroke, at times disengaging from each other - there is no play in the shafts so at this time the root cause of the problem remains unidentified. Al says he has new spark plugs coming for the Indian, along with a new rubber cover for the kick starter lever. Steve has also approved the purchase of a new magneto drive gear to replace the Harley part. The Harley drive gear apparently adversely affects the timing of the rear cylinder on the Indian! The powder coaters are done with the frame parts and Kevin's friend Matt Sheble picked the parts up from the powder coater's shop in Victoria, Texas. Kevin has the parts back in his shop in Austin. Kevin still needs to finish the restoration of the front fender, a part considered too delicate to powder coat. Not to mention reassembling the whole bike!! Kevin and Matt will be tackling the project in a few days. Looking forwards to seeing what the bike looks like after Kevin's mini- restoration / clean-up! On the 18th Cameron Whitaker put a new muffler on the French Model T ambulance, replacing the one that fall off last month on the way to Edna's Cafe at lunchtime! Ian replaced the French Ambulance's old coils with one of his brother's rebuilt super-coils which perked the motor right up! Cameron also installed a new starter on the Blue Racer. On the 25th Al Sumrall, Lynn Howell (with an assist from Killer - his dog) plus Cameron Whitaker fixed "The Leaning T of Kingsbury", the Model T French Ambulance whose body was observed persistently leaning to port! The vehicle's body had slipped on the axle springs so Al got underneath and fixed it - while being closely supervised by Lynn and Cameron. Ian and Cameron also did some switch work on the Ambulance's electrical system. Cameron, Lynn and Al had to troubleshoot the Blue Racer's battery box and they identified some modifications which will be executed next workday. Al modestly describes his role as encourager; specifically he nods and makes clucking noises as Cameron and Lynn diagnose the issues! The problem was that the battery box lid would not close over the battery. The problem stemmed from mods performed to lower the body on the chassis for that "racer look". The floor of the battery box ended up being raised slightly. The fix is to create a stepped floor that will drop the battery about 1/2" in the box and allow the lid to close properly. The Blue Racer's fuel tank has been leaking so it was removed - a surprisingly awkward task - and the fuel tank was sloshed by Mike Craig. The slosh had not dried by the end of the workday, so testing the tank's integrity will need to wait till next workday. On the 18th Terry Bledsoe and Mike McCormick put in a lot of work in the Blasting / Paint shop - relocating a lot of the stuff just shoved back in there, sorting and organizing Thomas-Morse parts to a safer & known location in the shop, sweeping out the area and storing the Tommy's wings back in there. Awesome job!! Terry and Mike finished a job Terry had started back in the middle of 2011. On the 25th Terry and Mike continued their efforts to clean and organize the shop. The paint room got more wings stowed away in it, and the attic and the room at the end of the aircraft shop (opposite end from the machine shop - a room so little used it doesn't even have a name!) received some attention! Terry also kind of directed some clean-up of the grounds - at the start of the day Allen was shredding and cleared most of the useable areas of the property. He then started a trash fire and Terry and Dave Orloff loaded up a bunch of old pallets and crates to feed the fire. Dave Orloff notified us that arrangements have been made for a waste oil and grease container to be dropped off at Kingsbury so that we will be able to start recycling oil and grease going forwards! Thanks, Dave! That was it for February!